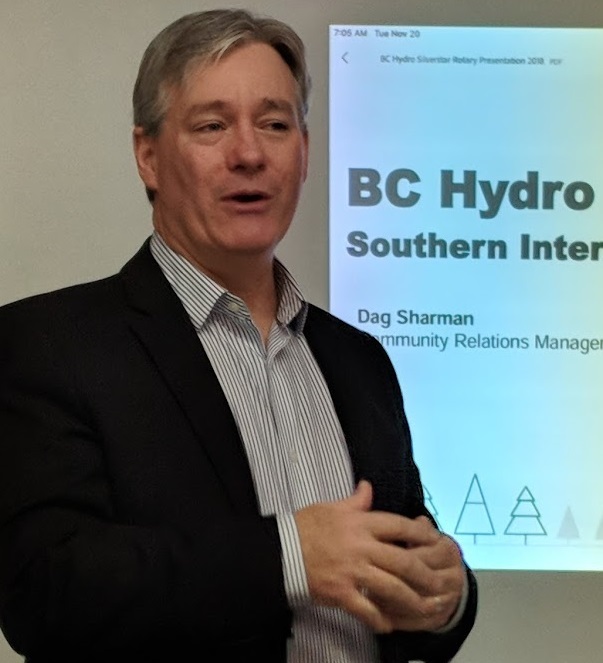 BC Hydro’s Southern Interior Community Relations Officer, Dag Sharman, explained the crown corporation has 4m customers, 30 hydro-electric power plants, 79,000kms of transmission lines, & delivers 98.4% “clean” (non-fossil fuel) energy. The Vernon plant is Hydro’s largest facility outside the Lower Mainland. Major upgrades in the past couple of years include a new 85,000sf office building, & new shops. Over 300 local employees work all over BC. The Kalamalka Rd site includes one of three provincial control centres, a call centre, engineering & other staff involved in design, construction & maintenance of transmission & distribution assets. Two new 500 megawatt generators were recently added at the Mica Dam, & plans call for addition of a sixth similar generator at the Revelstoke dam by 2026. The West Kelowna Transmission project will add a secondary line to serve West Kelowna. Hydro works with Emergency Management BC to manage power supplies through extreme weather events, & with provincial biologists to protect pesky ospreys building nests atop power poles!